Talking to another couple recently, Sharon and I were asked how long we had been together. When I responded more than 20 years, we were asked "what's your secret?" Some small part of this secret is days like today. We had a very nice day. Up fairly early, we had breakfast at the Green Lantern Inn. Packing up the car, the plan for the day was a hike in Big Sur. We drove down the coast to Julia Pfeiffer Burns State Park. I had never driven down the coast pass the turn off for the Carmel Highlands Inn. 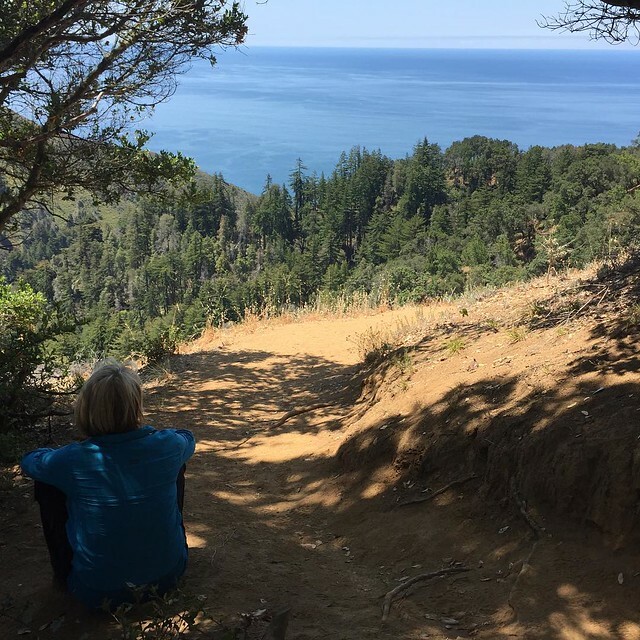 At Julia Pfeiffer Burns State Park, we hiked the Canyon Falls and Ewoldsen Trails. We covered a little more than 4.6 miles. The trail climbs for steadily for about 1,200 feet over the first half of the hike. There were some gorgeous views of the ocean. On the ridge over the ocean, we were able to see some grey whales. Have I said recently how much I don't like heights? A Google Map and views of the hike in Google Earth are here. Heading back north towards Carmel, we stopped at the Nepenthe Restaurant for a very late lunch. The place was packed. We sat in the bar and had an appetizer while waiting an hour for a table. The table was worth the wait; it had a spectacular view of the coast. I don't think that any picture could do the view justice. We split a shrimp sandwich and a bowl of chowder. After a nap, we got cleaned up. We wandered down to the Hotel La Playa for drink. From there, we wandered back towards the downtown. We had a bad glass of wine at Andre's Bouchee. We finished the night with a fantastic late dinner at the Flying Fish Grill. We split a great panfried oyster appetizer. Sharon had the Almond Seabass, while I had the Black Bean Halibut. We both enjoyed the day a great deal!